When you join March for Babies you stand with thousands of people across the country who share your commitment to building a brighter future for us all. You raise money to expand programs and educate medical professionals to make sure that moms and babies get the best possible care. You advocate for policies that prioritize their health. You fund research to find solutions to the biggest health threats. And you support moms through every stage of the pregnancy journey, even when everything doesn't go according to plan. 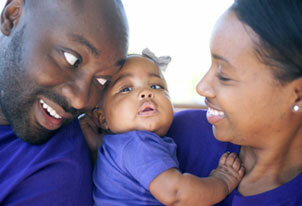 March with us to lead the fight for the health of all moms and babies. Because when a society supports every family, we all win. When we come together, even the toughest problems can be solved. Julie and Jevon McBride welcomed their daughter Juliana Charolette Madison McBride to the world after only 25 weeks and 4 days of pregnancy. She was born weighing just 1 pound, 11 ounces. Juliana spent months in the hospital. The first 10 weeks of her life were in a NICU, before she was transferred to a second hospital for neurosurgery. When her parents first saw their newborn daughter they were in awe at how tiny she was and how she fought to live from day one. Every day of Juliana's life in the NICU was emotional for her parents, who have shed many tears. Like most new parents, they never knew that love could be this strong. Today Juliana is thriving, and that's thanks to people like you who march and raise money to support the pioneering research and care that saves lives. Thank you for joining the McBrides and countless others at March for Babies this year, next year and as long as it takes to help every mom and baby get the best possible start. 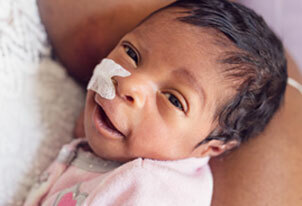 About half a million babies are born premature or with birth defects in the U.S. each year. Without ACA protection, maternal care would be unaffordable for most families. Vital services for moms and babies, especially babies born sick or too soon, are at risk. Join a supportive community of moms and families who have experiences similar to yours.